Suitable for indoor use, the AIVIA 100 cabinet is open access and protected by safety seals. 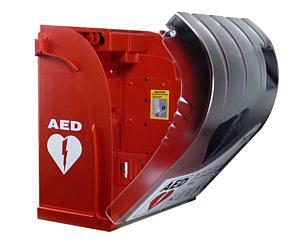 Robust and lightweight, the AED enclosure is made up of 2 distinct parts: a polycarbonate shockproof cover and a red ABS frame. These materials are well known in the industry, giving excellent shock resistance properties. The AIVIA 100 is equipped with an audible alarm, which sounds when the AED is removed. This alarm is combined with flashing red lights give a visual warning. The survival sequence and three clear pictograms with instruction for use are shown on the front cover. The AED acronym and the defibrillator logo (heart broken by an electric spark) are on the sides. Open access to the AED is protected by security seals. A luminosity sensor automatically activates white LEDs when the AIVIA is in the dark. 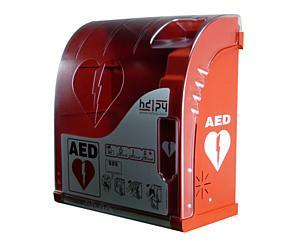 Removing the AED automatically triggers a visual alarm (flashing red LEDs) as well as an audible alarm (90 dB). Powered with 4 disposable batteries (4xLR20 included), the AIVIA 100 is meant to be installed indoors. With a free access, the cabinet offers helpful features to locate, protect, and make the AED available inside buildings.